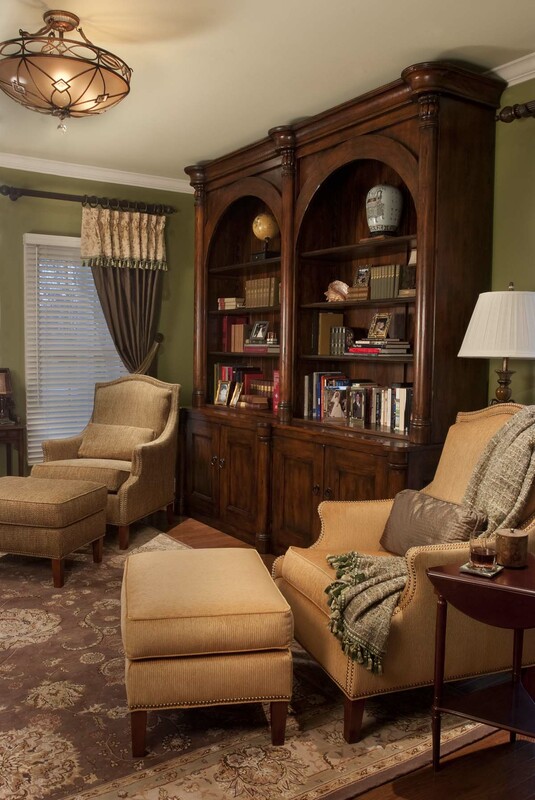 In many of the rooms I design, the paint color is actually based UPON the fabric. OK, I admit it…I’m a Fabric Fanatic! Why, you ask, am I so obsessed with something most people spend so little time thinking about? Well, I believe fabric has more power than almost anything else in a room’s design. First of all, in many of the rooms I design, the paint color is actually based UPON the fabric. That’s right: I pull the paint color directly from the fabrics, sometimes using a lighter or darker version of a color that is seen in the fabric. In my client’s kitchen, even the cabinets are finished in a color found directly in the fabric on the adorable pleated valance. Secondly, many of the main pieces of furniture have fabric ON them–like the sofa, for instance and the chairs. 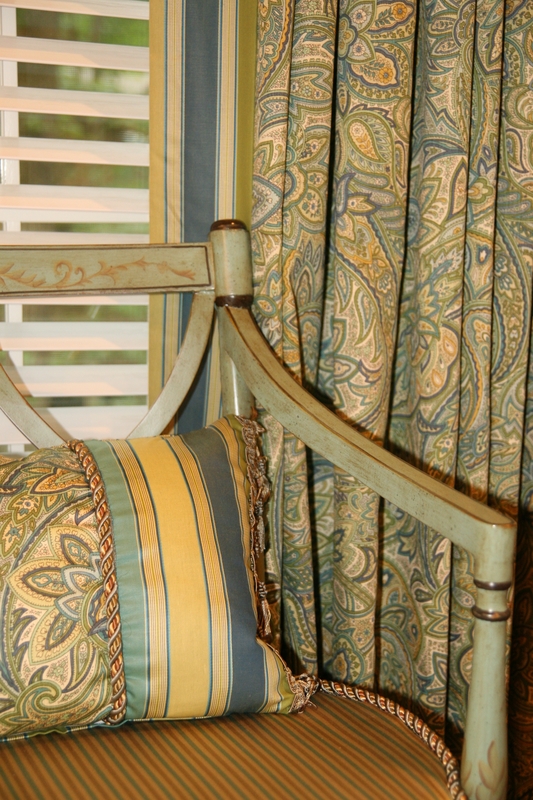 A bold Green wall color was chosen to enhance darker drapery fabric, and the furnishings support the color scheme in green and gold. But I must say, it’s at the windows where fabric is really able to shine! Let’s talk more about that topic next time. 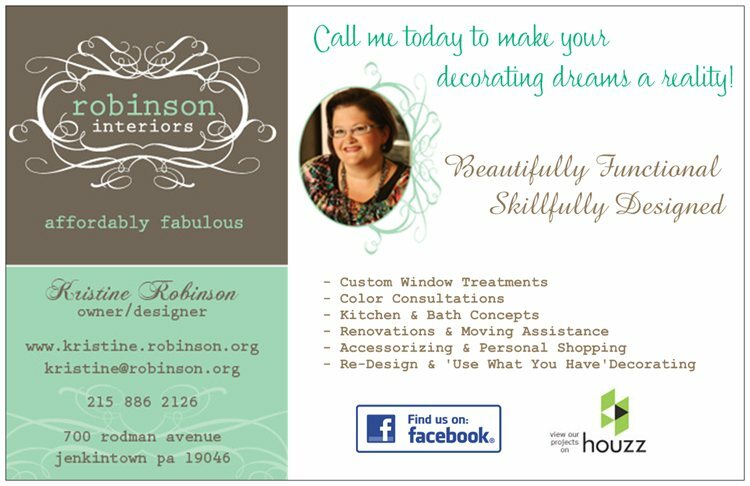 Please share and tell everyone about my blog. I need all the friends I can get! This entry was posted in Color, Decor, Decorating, Draperies, Fabrics, Furniture, Home, Home Decor, Interior Design, Renovation, Textiles, Window Treatments and tagged Blue, Cabinets, Color, Decor, Decorate, Den, Draperies, Fabric, Furniture, Gold, Green, Handpainted, Interior Design, Interiors, Kitchen, Library, Living Room, Robinson interiors, Textiles, Window Treatments, Windows, Yellow. Bookmark the permalink. Thanks, Jim. I LOVE fabric, and my stash of remnants just proves my weakness for beautiful pattern and color combinations!! There’s nothing more fun and than pulling a room together with fabric. Thanks for commenting!! 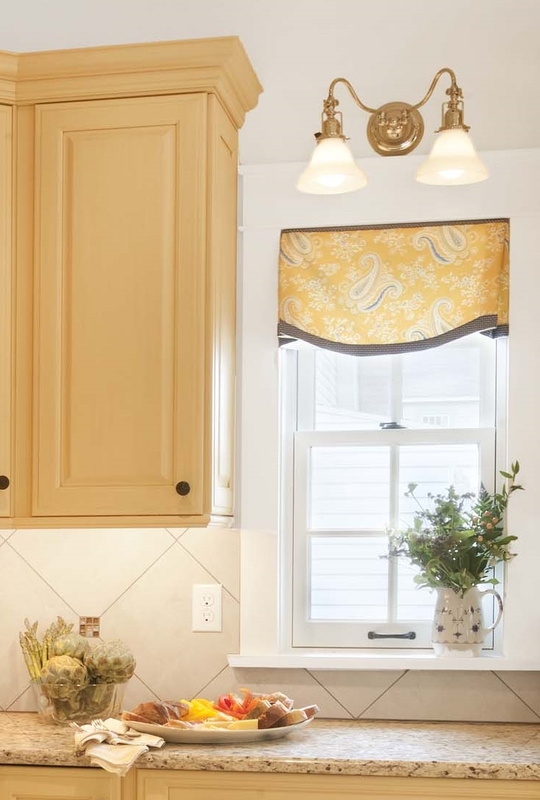 Love the yellow kitchen valance. Can you tell me where to find the fabric. Thanks for commenting Sue! I love this fabric too. Unfortunately it’s been discontinued for a at least a year. So sorry!